"If we accept that sound is vibration and we know that vibration touches every part of our physical being, then we understand that sound is heard not only through our ears but through every cell in our bodies. One reason sound heals on a physical level is because it so deeply touches and transforms us into the emotional and spiritual planes. Sound can redress imbalances on every level of physiologic functioning and can play a positive role in the treatment of virtually any medical disorder". - Mithcell Gaynor, M.D. One of the ways Sound Healing works is on the basis of "Entrainment". Entrainment was first discovered in 1665 by Dutch scientist Christian Huygens. He set up a room full of pendulum clocks with their pendulums swinging at slightly different times. When he returned to the room the next day, he found the sway of the pendulums had all synchronized. Thus, entrainment occurs when the powerful vibrations of one object actually change the less powerful vibrations of another object. Should the vibration of your body, specific part of your body or even organs be out of kilter due to illness, stress or injury? 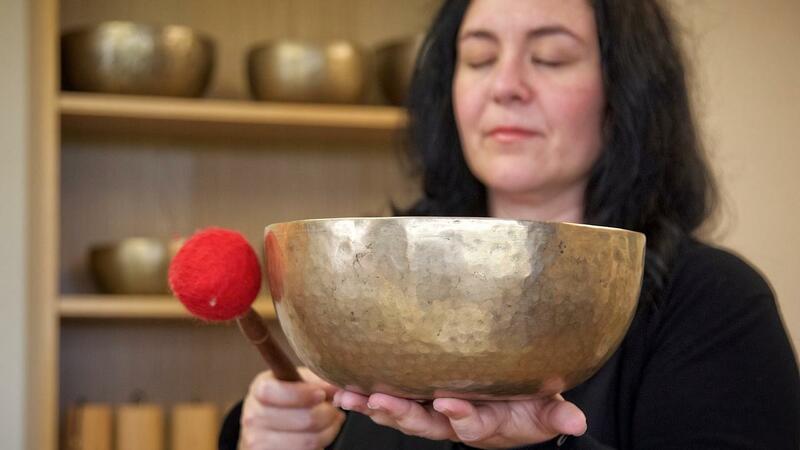 The sound vibration of the singing bowls can help bring up the vibration through entrainment. Through entrainment, sound healing promotes deep relaxation, reduces stress and pain and also develops self-awareness and creativity. See Jo-Anne's Introduction to Sound Healing for more information on how you can benefit and book a session. Also, try out the healing sounds of the Tibetan Singing Bowls by downloading the Free Sound Meditation by clicking on the image below... Enjoy!